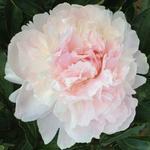 Growing peonies and seeing them flower is a sufficient joy of itself for many plant lovers. How and where they fit into the surroundings may be of little concern. On the other hand, interior and exterior decoration is a popular theme in our culture and the idea of creating beauty is well established as a loftier goal. For this or other, perhaps more basic, reasons, some of us are uncomfortable unless we have applied a measure of logic and form in deciding where to place the items which we add to our surroundings. 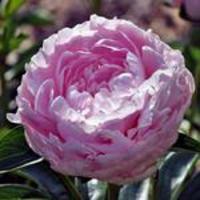 Picking the placement of our peony plants can become a matter of creative interest. The purpose of this article is to offer one man's thoughts on ways to approach the task. First, there is the more mundane, but essential matter of what it takes to produce fine peony flowers. The site is an important part of success. Peonies want a fertile soil. This means a good level of humus, as well as mineral fertility, and the site must be well-drained. 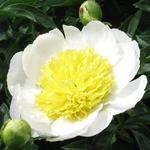 The latter is necessary because peonies cannot survive poor aeration of the soil around the roots. Thus, placement of peonies in many locations can require considerable soil modification, if they are to have a chance to perform in the manner we expect of them. It is also important to start with healthy, vigorous divisions. The smaller the division, the more important it is that optimum growing circumstances be provided (this is where the idea of "nursery" comes in, a place where small plants or propagation pieces can be carried to a better planting-out size). Peonies usually perform best when cultivated, reducing competition. Another consideration in growing peonies that should be emphasized is that of keeping the foliage and stems free of fungus diseases. One reason is that the quality of flowering depends on the amount of growth in the storage roots the summer before. Loss of leaf surface to fungus infections reduces the rate of food production. In many sections of the world where peonies are grown, climate conditions are favorable to the infection and spread of leaf diseases. While these leaf infections rarely destroy plants in one season, they can be responsible for decline over several seasons. Fungi are also responsible for root rot, which can lead to destruction in one season. The importance of plant health in landscape appearance cannot be over-emphasized. While the autumnal decline of foliage is quite compatible with landscape appearance, unseasonable death of foliage is distracting. Some peonies inherently decline in midsummer, somewhat as daffodils and other spring bulbs, although usually later. The Officinalis and Lobata Hybrids are notable groups which tend to this pattern of growth. Since peonies are a factor in border height and provide background for other plants in certain situations, one needs to anticipate whether the variety being placed will cause an unwanted "hole" to come in the border when the foliage goes bad. A more dramatic illustration of this problem can be envisioned in a row of peonies, say along the side of the front yard, where you mostly have plants of Chinese peonies (Paeonia lactiflora) which hold their foliage right into autumn in most varieties, but with one or more Lobata of Perry Hybrids, most of which tend to die-back in mid-summer. Sometime before autumn the hybrid foliage will naturally decline. When you groom the border by taking out the spent stems, there is a "hole" in your row. You can prevent this at planting time and still not give up having the beautiful hybrid colors at flowering. Simply put the hybrids on one end of the row. When the offending foliage is groomed out, everything looks about the same, except the row is shorter for the balance of the season. Cut-flowers may be most conveniently grown on peony plants placed in "island" beds in a utility area, as one does with a vegetable plot, out of the public portion of the grounds. The big double peony flowers may be spoiled by rain, their stems broken down due to waterlogged flowers, as well as the flower life being shortened. Grown in a cut-flower area, the blossoms can be freely cut and taken indoors, without diminishing the publicly viewed borders. Of course, big flowered peonies in public areas can be given extra support and their appearance thereby largely preserved out-of-doors, even in rainy weather. Choose varieties which are less vulnerable to rain damage for easiest maintenance of border appearance. Those which bear their flowers closest to the bush are not so vulnerable to stem breakage by water-logged flowers. Also, some varieties are notably better equipped to resist stem leaning or breakage. The less double forms are not prone to hold great quantities of water. The single and Japanese flower forms are best in this respect. However, the bomb double form presents a nice compromise, having a more single form on first opening, but taking on the large size of the full doubles as the flower matures. Also, the fact of the bomb form growing over a period of several days gives extra interest in the border. Flower color is a factor in border appearance. In light colors of white, blush, light pink, and yellows, the large flowers of peonies are notable at relatively great viewing distances. At similar distance some of the red flowers may go nearly unnoticed. Most photography buffs have had the experience of taking a black and white photo of a gorgeous red peony and have seen the red show up as black holes in the greys of the foliage. This is similar to the effect of viewing them at longer distances in the landscape. Place the red flowering choices at the near locations and limit the longer views to the lighter colored forms. This principle can be applied to distant borders. For example, walking through a large garden, as one comes around an out-curve of shrubbery, the near peonies might be red. Color enthusiasts are sometimes interested in weaving subtle color sequences into their landscape borders. This is an obvious challenge, since one will have to collect knowledge and experience in not only color of specific varieties, but the timing of flowering, etc. Whether or not one is approaching this advanced challenge in border arrangement, it may be of interest to note that both blue-based reds and yellow-based reds occur in peony flowers. The range and variety of reds have been expanded immensely with the production of interspecies hybrids. These reds appear both as entire colored flowers, as is widely known, and as the pigment of the subtle markings in the fascinating range of pastel colors which have appeared among the modern hybrids. These pastel variations are of great interest to some flower arrangers, but they so far occur most prevalently in less double forms, therefore fitting nicely into the logic of selecting peonies for landscape borders. It is perhaps obvious, but nevertheless of great importance, in the landscape placement of peonies to keep in mind where they fit into the structural design hierarchy of plants. It is the woody plants which stand highest in this hierarchy. Trees are the most dominant, grading down to the finest textured twiggy shrubs. The trees and larger shrubs give the height and enclosure functions in landscape design. Herbaceous plants contribute filler and color. While the tree peonies are shrubs, they are not strong structural contributors. Herbaceous peonies are of strong texture and fairly massive among the non-shrub plants. Most peonies including tree peonies come into use as facers for intermediate shrubs. They may provide transition areas to lesser-texture border plants or may be a major factor throughout a border. The latter application is well known by peony fanciers-we are continually running out of space for our latest additions! While structural elements, which give height and enclosure, are extremely valuable in landscape good appearance, it is not necessary to obtain all of this with living materials. When space is at a premium in a key location, it may be impossible to both give room for background plants for your peonies to be seen against, and have room for the peonies. Consider a fence of boards or other suitable materials. This can be combined with appropriate shrubbery for border ends. A nice feature of the fence is that it is the right size when placed. Another is that it does not compete for moisture and soil. 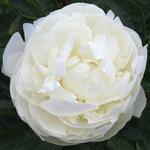 Peonies can be used in an infinite array of situations in the home institutional plantings. How one chooses to use them is an individual choice. When given growing conditions which are suitable to their needs, peonies will perform the beautiful flowering for which they are desired. How much more complex one may wish to make the task of weaving them into their larger surrounding can be as challenging and delightful as it takes to meet one's fancy!